The imaginative work ranks as one of Attack's best in years. Photo courtesy of Martha Rial. Brent Luebbert and Kaitlin Dann in Attack Theatre's Soap Opera. Because Attack Theatre is best known for its clever, lighthearted fare, it would be easy to assume that the troupe's latest program would fall into that category — especially when it's titled Soap Opera. But uncharacteristically, the work's subject matter is far more serious. This is a show chronicling the last days of a man on his deathbed. 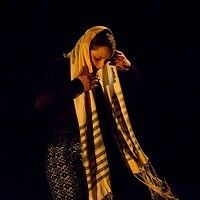 Inspired by both the legend of Scheherazade and the emotional passing of a company board member, Soap Opera mixes dance, mythology and opera music to tell the fictitious story of George Smith, a terminally ill concert pianist, and the loving efforts of opera singer Katarina to keep him alive by reading him colorful stories. 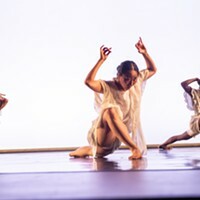 The eight dancers act at times as George and Katarina's dance doppelgangers, players in their subconscious or as characters in the stories Katarina tells. The latter are the most engaging of the multiple roles. The two-act work is choreographed by Attack artistic directors Michelle de la Reza and Peter Kope. One story, set to Camille Saint-Saens' "Bacchanale" from the opera Samson and Delilah, uses the music's raucousness to heighten the tale of a party where the guests' carnal instincts run amok. Another features dancer Dane Toney as a charismatic pirate who fends off multiple attackers with humorous swordplay that ends with him seducing one of his attackers, danced deliciously by Kaitlin Dann. Soap Opera's genius comes through combining Attack Theatre's "let's put on a show" enthusiasm with some truly poignant imagery and moments, such as George (played by Mark Staley) periodically rising from his deathbed to don a tattered tuxedo coat and drag out a broken-down piano. There's also a moving first-act aria sung by Pittsburgh Opera's Nicole Rodin as Katarina, with accompaniment by pianist Karen Jeng. Act II is set primarily in George's mind, with him struggling like Sisyphus with a large boulder. Meanwhile, the players in his mind push the immense rock up a ramp, only to have his doppelgänger (Toney) push it back down and then summarily execute them all in the moments leading up to his death. The imaginative work, ranking as one of Attack's best in years, ends sadly. But in typical Attack fashion, the scene soon switches to George inhabiting a jubilant Peter Pan afterlife, capped by an especially satisfying final image.